The seemingly frivolous sphere of social media – all selfies, hashtags, and emoji – might not seem the most obvious match for the serious world of academic publishing, whose books and journal articles can cover some of the most complex and important topics. 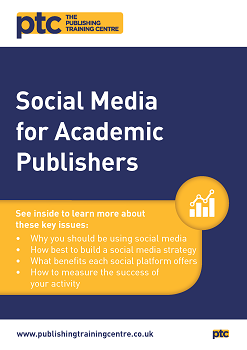 And yet social platforms such as Instagram, Twitter and Facebook offer some of the best – and most cost-effective – opportunities for publishers to play an active and valuable part in the lives of the scholarly communities they serve. They enable publishers to become more present within those communities, to build deeper relationships with them, and to learn more about and understand better their needs and desires. Perhaps just as importantly, given the growing public perception of academic publishers as profiteering corporations adding little value to the research community, social media platforms allow publishers to demonstrate and draw attention to the worth of what they do. And they can help increase the impact of an article, and sell more copies of a monograph too. You might be interested in PTC's flagship course for commissioning editors in academic publishing, or the PTC workshop designed to help build a social media strategy as part of a broader content marketing strategy.